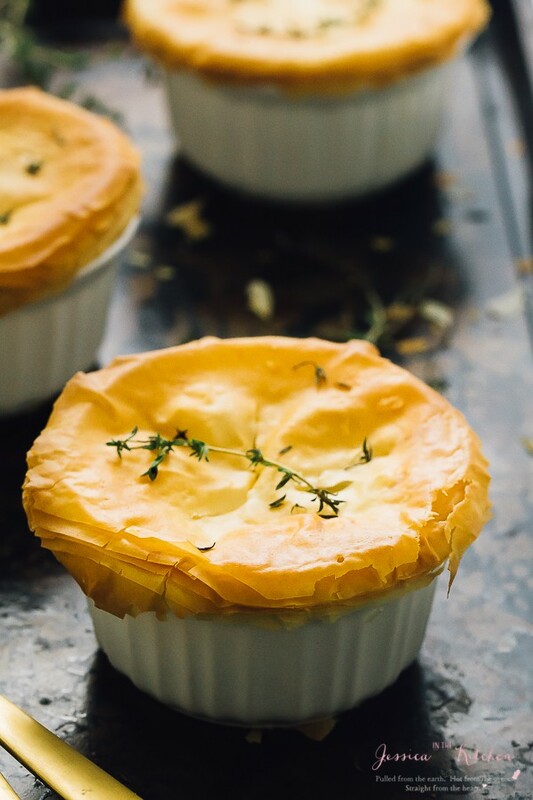 These Vegan Pot Pies are gluten free and are done in less than an hour! They are loaded with only healthy, delicious and filling ingredients! 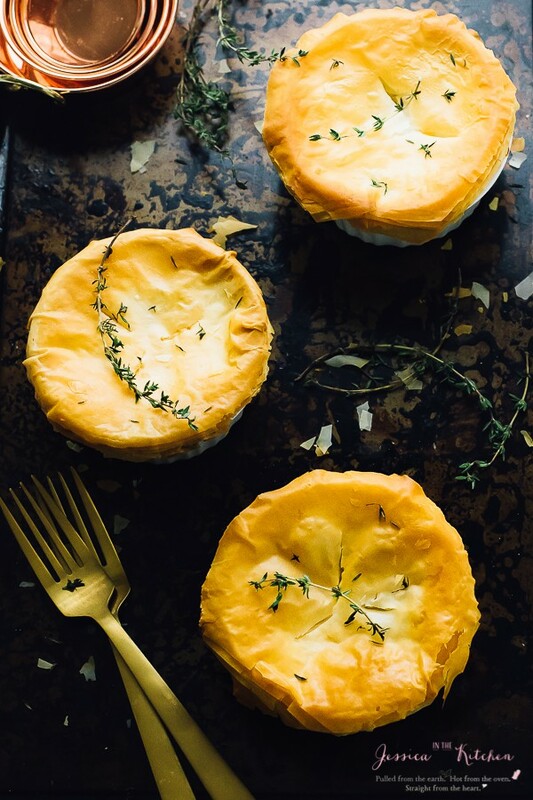 Great news: These Vegan Pot Pies will be one of the easiest dinners you’ll make for Thanksgiving. Truly. It’s almost 100% one pot except you transfer the filling to ramekins, top them and then bake up. Apart from how easy they are to make, they are truly, truly delicious. If you need anymore convincing to check these out – they are finished in under 1 hour. Let’s go see how these beauties are made! So what exactly is a vegan pot pie, or at least these? Veggie loaded, thick and creamy sauced pots of goodness topped with flaky filo (or phyllo) dough, pie crust or baked biscuits. It’s one of the ultimate warming and comforting dishes ever that are perfect for the upcoming (or here) cold weather. Best of all, it’s actually still healthy. 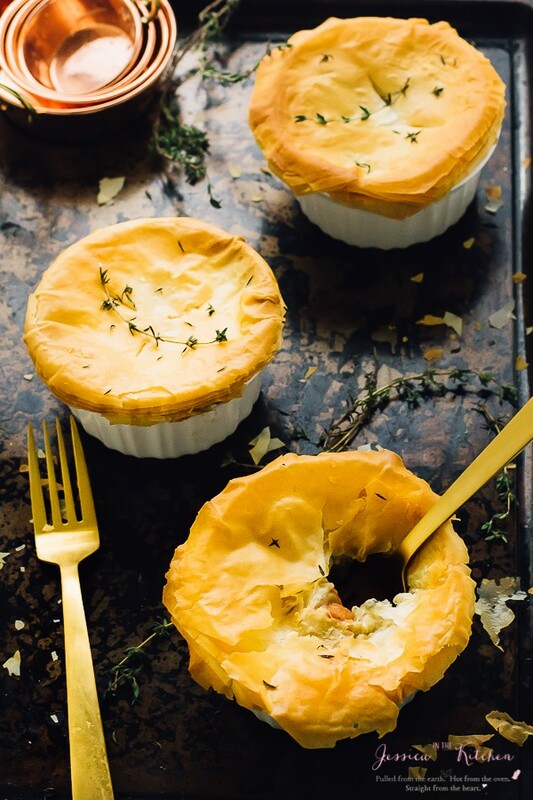 That’s the thing: these vegan pot pies are made with all veggies, a little bit of gluten free flour (like a tablespoon), veggie broth and seasonings. So, absolutely zero percent guilt while eating these and 100 percent delectable taste. So, what should you top these with? I chose filo only because I wanted a change. You can buy gluten free filo or you can make phyllo if you’re feeling adventurous. You could also top these with my gluten free vegan pie crust, which will give you a divine flaky crust. Also a great option, gluten free puff pastry. They’re all a win win in my books. I actually adore how beautifully healthy these are! They are only calories without the topping (because you can choose whichever you desire). The carrots provide lots of beta carotene and you can add as many or as little as you want. This is another great thing: feel free to increase or decrease any quantities you want to your taste. Q: How do I reheat these vegan pot pies? A: I like to remove the topping, reheat in the microwave, and then reheat the topping for the last 10-20 seconds to just heat it through and keep it crispy. Alternatively, you could reheat it in your toasted oven at 350 degrees Fahrenheit for about 10 minutes. If you try these Vegan Pot Pies (Gluten Free) please let me know in the comment section below, or tag me on instagram with the hashtag #jessicainthekitchen! For more exclusive recipes follow me on Instagram AND on Snapchat: jessinkitchen. Preheat oven to 375 degrees. Set aside 5-6 ramekins. In a pan over medium heat, melt vegan butter. 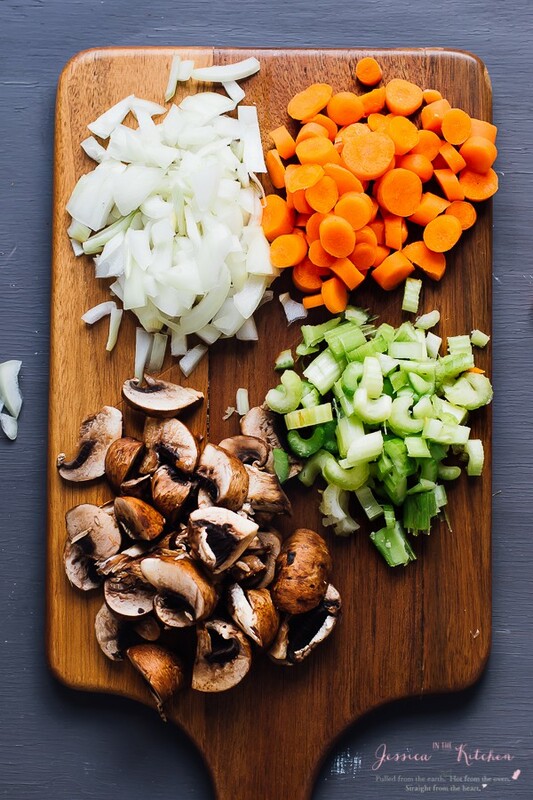 Add the onion, carrots, celery, mushrooms, garlic and thyme and stir. Allow to sauté until onions are translucent and carrots have softened a bit about 8 minutes. Add in the gluten free flour and mix to coat veggies. I like to set mine set about 2 minutes to brown a bit. Add the vegetable broth and salt and pepper to taste (just a pinch, taste test later on). Bring to a boil then lower to a simmer for about 5 minutes to soften the rest of the vegetables. Add in the frozen peas, stir and remove from heat. Taste test and add more salt and pepper if necessary. Pour mixture into medium sized ramekins and top with filo or dough. Bake for 30 minutes, watching tops to see if burning. If starting to brown, cover with foil. Broil on low for a few minutes to brown topping. Remove, allow to cool slightly, serve and enjoy! You can store these by placing them in the fridge, covered or uncovered with foil. You can reheat by removing topping, microwaving, and them putting on topping and microwaving that for 10-20 seconds. Alternatively, you can reheat in the oven at 350 degrees Fahrenheit for 10 minutes. We LOVE filo and pot pie is definitely another favourite here too. So this is a win-win recipe! 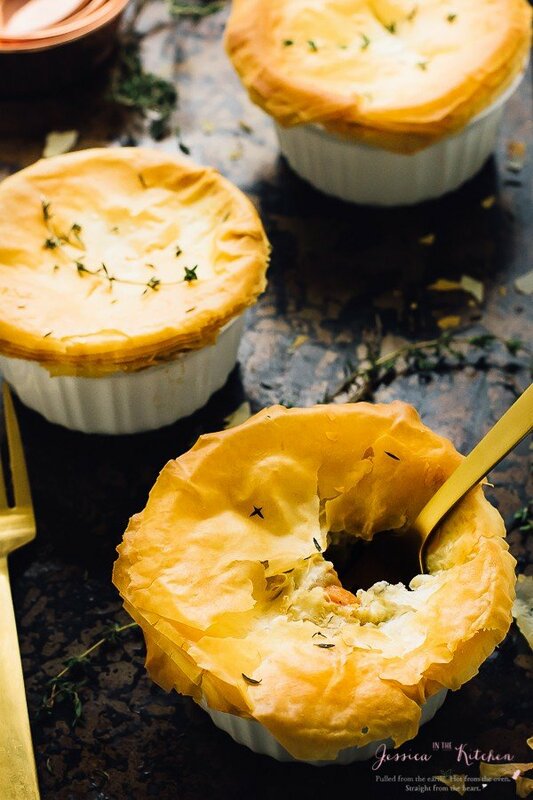 These pot pies are adorbs! I love pot pie, and know I would love this vegan version even more than the original! So nice to know that they are pretty quick to make! Another fab post. I could have 1 (read: 100) of these right now! What type of phyllo dough do you use that is Gluten free or do you make your own ? Can’t wait to try . Our daughter was just recently diagnosed Celiac . This is a really good recipe Jessica. It’s beautiful, it looks flavourful and I eat all of the ingredients. Thanks so much Kalisse!! If you give it a try I hope you enjoy it!! What would you suggest to do when preparing this dish for a meal ( Thanksgiving) ahead of time. Perhaps make the filling, put it in the ramekin and refrigerate until ready to put on top and bake? Any other thoughts? Preparing, then taking off top to bake eeems a bit of a drag when you have company. Yup that sounds like a great way to make it before hand! Or even to make it all and place in a Tupperware, then into the individual cups when ready to bake! I hope that helps!! How many servings does this recipe make and how large are the ramekins? I I hear back from you in time, will make this for Thanksgiving – beautiful presentation and healthy ingred appreciated! I hope this is enough time for you!! My ramekins are 7 ounce/207ml ramekins. It serves about 3-4 servings, so if you want to make more, you can easily double the recipe, or even serve it in a large casserole dish instead. I really hope that helps and feel free to message me with anymore questions – I’ll answer right away this time haha! Happy Thanksgiving when it comes!! I found a random brand in Whole Foods – so check there out!! It’s easier to find GF puff pastry so look for that one – I hope that helps!! Random meaning I can’t remember the name!! I believe the brand is Geefree Puff Pastry Sheets. Unfortunately they are full of butter and cream. I will have to continue to look for a vegan version. Maybe it will work for you, though. Once you have downloaded and install the data after that tap on it to install Netflix apk for your Android tool. Netflix Login Sign In Account Page for Members. I made these for Thanksgiving along with another main and these were a hit!!! I didn’t change anything and used organic vegan pie dough. Was the bomb! Thank you so much. So easy to make so this will be a staple item for this household. Thanks, Jessica. When do you put the filo on top? Just had this, my wife and I prepped it together and ate it together. Was super simple and tasted amazing. Only changes we made was dropping the shrooms and adding asparagus, leeks and turnip. Thanks a million for putting this online you rock!!! I like my pot pies with a crust. Do you think prebaking your pie crust recipe in a few small anchor hawking dishes would work? Then add the filling and top with more dough would work? Or maybe using the pie crust like a pastie? oh that sounds yummy! I think that could work since the crust is meant for a heavy weight. Just ensure you don’t make it too thin! I would definitely pre-bake first, then add filling, then top with more dough, then bake! I see they food you make becoming a vegan is hard at times making cream without the milk . Do you mean the roux? It would’ve been the same process even if we weren’t vegan! Being vegan isn’t hard at times with this at all! If you want to use a cream substitute, you can use coconut milk!